IBM claimed to build the world’s fastest Graphene transistor. The IBM researchers claimed to make a Graphene Field Effect Transistor that works at frequency ranges of few Giga hertz.This research could prove making of efficient and super speed computing device. Myself being a Electronic student know the importance of Transistor and the transition time and working speeds. All chips circuits are now made using transistor as the basic building block. Previously Germanium and Silicon were widely used but the speeds were limited and hence we saw formation of dual core and quad core…But this new research may prove a new turning point for the Electronic World. Graphene is a special form of graphite, consisting of a single layer of carbon atoms packed in honeycomb lattice, similar to an atomic scale chicken wire. Graphene has attracted immense worldwide attention and activities because its unusual electronic properties may eventually lead to vastly faster transistors than any transistors achieved so far. The operation speed of a transistor is determined by the size of the device and the speed at which electrons travel. The size dependence was one of the driving forces to pursue ever-shrinking Si transistors in semiconductor industries. A key advantage of graphene lies in the very high electron speed with which electrons propagate in it, essential for achieving high-speed, high-performance transistors. Now, IBM scientists have fabricated nanoscale graphene field-effect transistors and demonstrated the operation of graphene transistors at the GHz frequency range. More importantly, the scaling behavior, i.e. 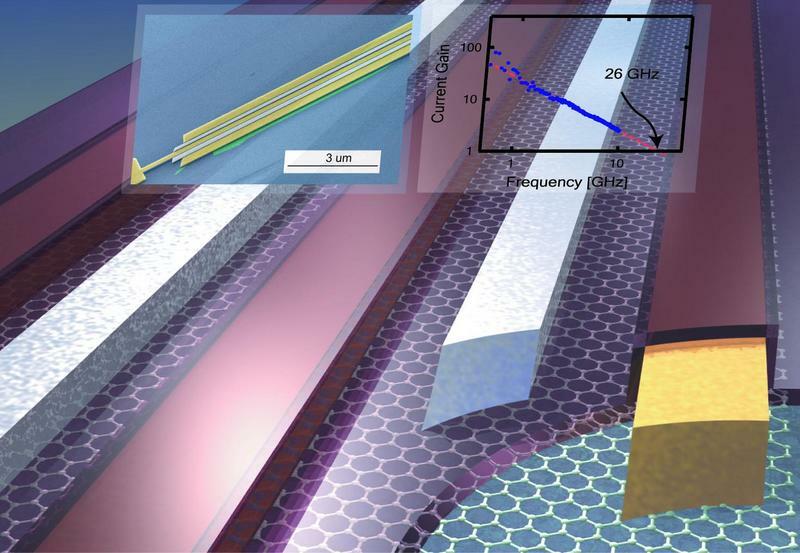 the size dependence of the performance of the graphene transistors was established for the first time. The team found that the operation frequency increases with diminishing device dimension and achieved a cut-off frequency of 26 GHz for graphene transistors with a gate length of 150 nm, the highest frequency obtained for graphene so far. The report on this work, entitled “Operation of Graphene Transistors at GHz Frequencies” is published today in the journal Nano Letters and can be accessed at http://pubs.acs.org/doi/abs/10.1021/nl803316h.